What does it take to build a good-sounding DAC these days? In general, it requires a mixture of the latest technology plus engineering practices that have stood the test of time. Some DACs focus on implementing the fastest sampling rates or on the latest file format or technology, e.g., MQA, DXD, and DSD256. Others might pay more attention to reducing electronic noise and vibration. If you’re willing to accept these limitations to realize extraordinary playback of Red Book and medium-high-resolution PCM files, then the Mystique v3 DAC may be right up your alley. After all, what matters more is how it sounds, not the type of input file. Virtually all recordings are available in 192kHz or lower-resolution PCM versions, even if they were mastered at a higher resolution, so it’s not like you’re going to be limited in the availability of the latest recorded albums. The Mystique v3 (hereafter referred to as the Mystique) was possibly the simplest DAC I’ve seen—just a somewhat hefty black chassis of folded metal with dimensions of 17.5" by 3.25" by 12" that weighs 23 pounds. Features are limited: three inputs (USB, coax, optical), with three buttons on the front panel allowing the user to select the desired input, and LEDs indicating which one is selected. Depending on whether the Mystique has balanced and single-ended outputs ($7555) or only single-ended outputs ($5555), the price is based on what’s not there as much as what features are included. In other words, on simplicity. Per the Mojo Audio website: “Our ultra-purist R2R topology has no digital filters, noise shaping, upsampling, oversampling, or error-correction. 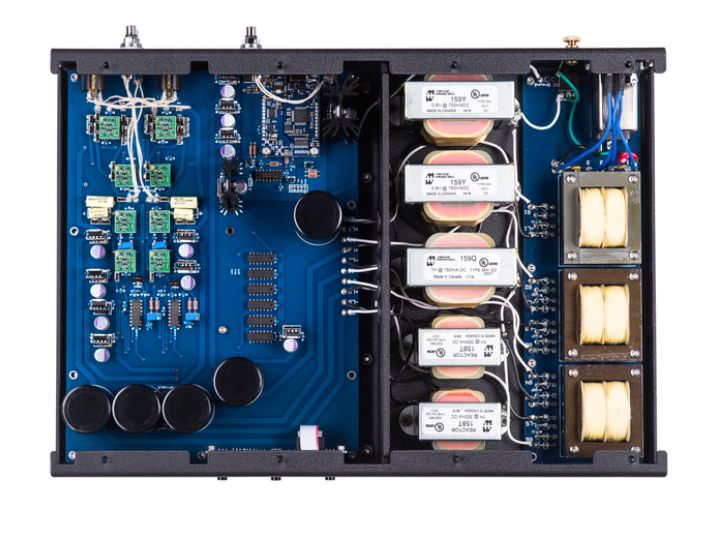 Our direct-coupled analog output stage has no output capacitors or transformers to limit bandwidth or color the sound. For optimal performance we use multiple ultra-low-noise, ultra-high-dynamic dedicated power supplies that isolate each type of chip or clock… Our technology brings you closer to the original musical performance.” That last sentence is what got my attention; after all, isn’t that what the high end is all about? Zwickel calls his ultra-purist approach “error prevention vs error correction.” If that goal is achieved without the latest bells and whistles, why do we need gigahertz sampling rates and complex encoding schemes? Sometimes we lose track of that. I know I have. Sometimes I’ve blithely assumed technical advances automatically equal sonic improvements. Was I wrong? Put the DAC on a shelf and add any isolation devices. • Plug the power cable into the IEC to establish Earth ground. Plug in the digital input cable(s). Plug in the output interconnects (balanced or single-ended). Turn on the power using the switch above the IEC connector. Push one of the three input buttons on the front panel (USB, coax, or TosLink). Turn on your digital source (streamer, server, or transport). Leave the DAC turned on 24/7 for optimal performance. If there are any problems, turn off for one minute, and turn back on again. That’s it. I suspect that audiophiles who are cowed by the numerous options on many DACs will welcome this simplicity, which I’d describe as plug-and-play. Since my review unit was the balanced model, I connected it to my linestage with balanced The Mountain interconnects by van den Hul. A minor glitch: The Mystique’s XLR output jacks were not marked to show right or left channels. A small annoyance. Easy to figure out: The one on the left is left and the one on the right is right. An Audience Au24 SE power cord that’s specifically designed for digital components provided the AC power. SOtM’s overachieving sMS-200 network audio adapter served as the source, fed by the company’s mBPS-d2s battery power supply. An Audience Au24 SE USB cable connected the SOtM to the Mystique. I used Roon playback software; the Roon Core was installed on a Dell Latitude E6330 laptop, with Roon remote control software on my iPad and on a separate Windows 10 laptop computer I use to jot down listening notes. Music files were stored on a USB drive attached to the Dell laptop.